(Newser) – Dutch-led criminal investigators said Wednesday that after a two-year probe, they have solid evidence a Malaysian jet was shot down by a Buk missile moved into eastern Ukraine from Russia, the AP reports. Wilbert Paulissen, head of the Dutch National Police's Central Crime Investigation department, said communications intercepts showed pro-Moscow rebels had called for deployment of the mobile surface-to-air weapon and reported its arrival in rebel-controlled areas of eastern Ukraine. 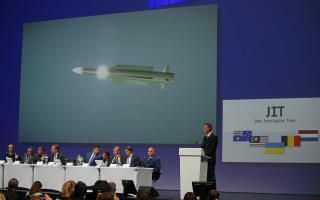 From that and other evidence culled by the Joint Investigation Team—including counterparts from Australia, Belgium, Malaysia, and Ukraine—"it may be concluded MH17 was shot down by a 9M38 missile launched by a Buk, brought in from the territory of the Russian Federation, and that after launch was subsequently returned to the Russian Federation," Paulissen told a news conference. Forget the data flying over the area is suicide in the first place! Russia is right you can't argue with their data or anything else because it's always the way they want so let's leave facts out of this.